George Herbert gave up a career in politics to become a church minister. He also gained a reputation as England's finest religious lyricist. This gift book introduces Herbert's life and work and features 30 quotations from his writings, arranged thematically to provide short meditations. - Publisher This gift book introduces Herbert's life and work. It offers 30 quotations - from Herbert's poetry and prose - arranged thematically to provide short meditations to last a month if used daily, or to dip into now and again. 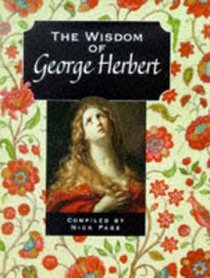 About "Wisdom of George Herbert ,The"
This gift book introduces Herbert's life and work. It offers 30 quotations - from Herbert's poetry and prose - arranged thematically to provide short meditations to last a month if used daily, or to dip into now and again. He also writes regular articles for Youthwalk, Christianity and Renewal, and works for a number of charities and NGOs. He and his wife, Claire, have three daughters and live in Eynsham in Oxfordshire, England.